As an aspiring athlete I get pretty hot sometimes while I play, so it’s nice to have a fan handy. What do I play? Esports… as in electronic sports… as in video games… as in not actual sports. Still, it takes a lot of energy to click goblins to death—especially when you weigh 3 times your character’s level and your hand meat gets all sweaty even when you’re not gaming. 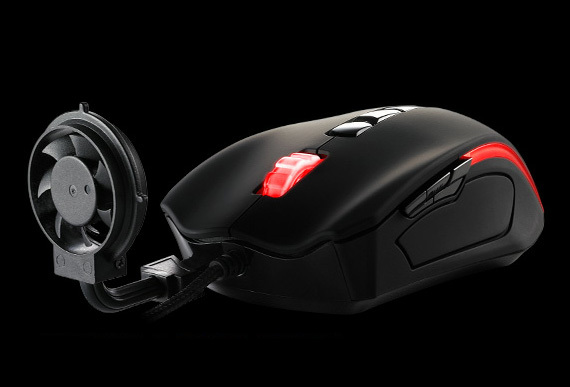 That’s why Tt eSPORTS has developed the new patent pending BLACK Element Gaming Mouse Cyclone Edition, which is a really long way to say “mouse with a fan on it.” According to the product page it “blows away your gaming tension and sweat…” and dignity.